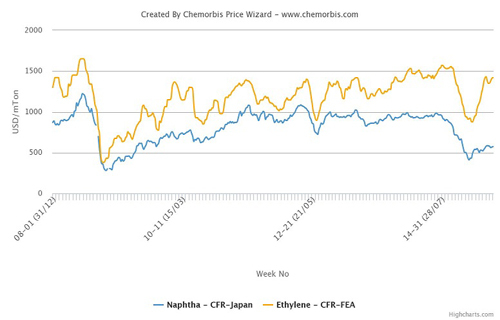 According to ChemOrbis Price Wizard, the spread between ethylene and naphtha prices in Asia reached their highest levels reported since 2008. Current Asian naphtha prices are almost $400/ton below their levels reported a year ago. This downward trend on naphtha costs is in line with the trend observed in crude oil prices on NYMEX, as seen from the below graphic, created via ChemOrbis Price Wizard. The OPEC meeting that was held on June 5 in Vienna, Austria resulted in a decision to continue with steady crude oil production, targeting 30 million barrels/day as a ceiling, for another six months, until the group meets again on December 4, 2015. Likewise, spot ethylene prices in Asia have been mainly below last year’s level during 2015, but since February, they have experienced a sharp and prolonged upward trend. After hitting a low for the year in February, spot ethylene prices are now standing around $540/ton above levels reported in February. The heavy maintenance season in Asia that started around April and is expected to last until the June-July period was behind the increases on ethylene prices. 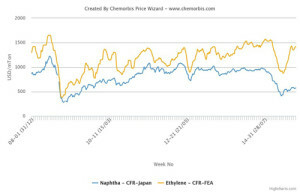 Due to the sharper hike in ethylene prices, the spread between Asian ethylene and naphtha prices reached over $800/ton, according to ChemOrbis. However, recently, Asia has started to see some plant restarts in the ethylene market. Samsung Total and BASF-YPC have already restarted their crackers by the second half of May while Idemitsu Kosan also restarted their cracker with 374,000 tons/year ethylene capacity on June 5. Dushanzi Petrochemical is to restart its 1.2 million tons/year cracker in China by mid-June. Although there are still some plants off line in the region, they are expected to resume operations soon. Mitsubishi Chemical’s cracker with 495,000 tons/year ethylene capacity was shut in the second half of May and is slated to restart by the end of June. YNCC’s No 1 cracker is to resume operations by mid-June. The cracker was shut for maintenance by mid-May. Formosa Petrochemical shut their No.1 cracker with 700,000 tons/year ethylene capacity on June 9 for 40 days maintenance while Mitsui Chemical’s 600,000 tons/year Chiba cracker is to be shut between June 20 and July 19 for 39 days.